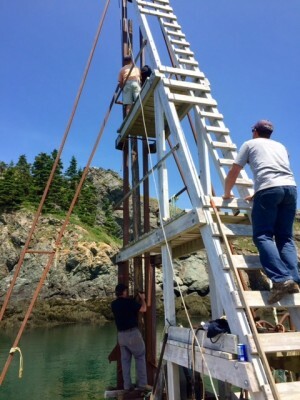 Before arriving on Grand Manan for the 2017 Summer Field Studies Program, I had been thinking about landscape and how it shapes people’s livelihoods, from what we eat and how we cultivate or harvest our food, to how we communicate to each through time via myths, legends, and folklore. Medicine in both physical and spiritual form passed down through how people speak to each other across generations of knowing an environment intimately. 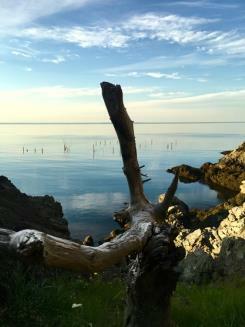 And by intimately, I mean how the land and the water can give and take everything from someone. Food, shelter, joy, death, heartache, anger, and wonder along with the many other complicated emotions such a long and nuanced relationship to the natural world and its cycles can have. Grand Manan is indeed a special place, and our time here has been blessed in many ways. 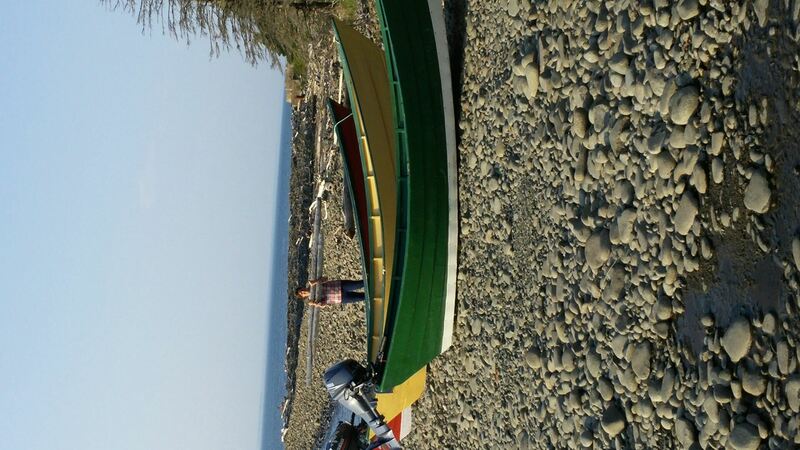 Our conversations with Islanders and with people “from away” who have lived on Grand Manan for many years, have given us a glimpse into the life and history of a relatively small island rich in the life of the sea and the fishing industry. Being on Grand Manan focused my attention in conscious and subconscious ways (my dreams on Grand Manan have been filled with the sea) to the rhythm of time and routine. The ferry coming and going, the fog arriving, and the subsequent steady hoo-oot of the fog horn from the Swallowtail Lighthouse, the tides (some of the most extreme found on the planet) rising and falling, the activity in the harbor, boats going out, boats coming in, tourists arriving and departing, the sun and moon rising and setting. The constant hum of work, and the shift from one task to another. 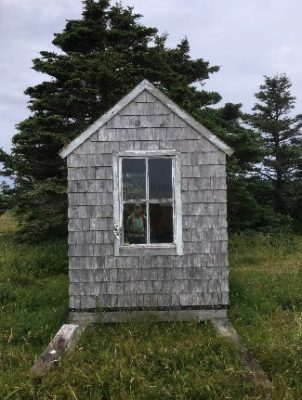 This strong sense of routine and rhythm sparked my interest in learning more about daily life and the experience of raising families on Grand Manan. Katie and I had the great pleasure of spending a couple of hours speaking with Carole Guptill. Carole has a wealth of knowledge about Grand Manan, and shared many stories with us from her experiences raising a family and being a nurse on the island. 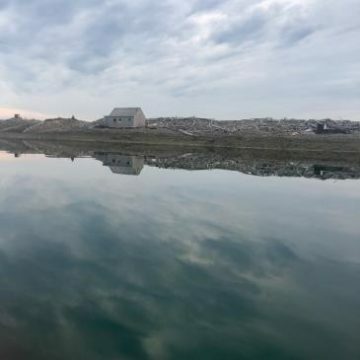 One blog post can in no way do justice to Carole’s stories that ranged from historic storms, funny anecdotes about raising children near the water, herring smoke houses, island ghosts, and babies being born mid-air while mothers were being flown to the mainland. Carole has a warm smile and her eyes twinkle as she talks. We sat in her cozy light-filled living room while the sea glittered down across a freshly cropped lawn dotted with a few tall Spruce trees. There were jars of sea glass atop the coffee table and side tables around the room collected over the years from Grand Manan beaches. Carole excitedly showed us the latest addition to her collection, a small perfectly smoothed piece of brilliantly red sea glass – a rare and remarkable find that she happened upon just when she was about to give up looking that day. A fine ruby slipper among the more common green, blue, and white pieces. 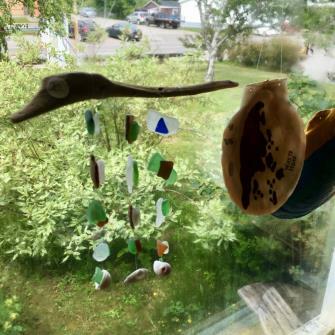 Carole makes lovely little hanging mobiles from drift wood and sea glass. A few of these hung in the windows bringing little points of bright color to our peripheral vision. While Carole told us tales, showed us her collection of vintage Grand Manan postcards, and beautifully recited a few of her poems from memory, I couldn’t help but think how the sea had shaped these little shards of glass, taking them sharp and pointed, and wave after wave smoothing them into little pebble jewels for beachcombers to delight in finding. Much as the stories of Grand Manan have been shaped and kept by island life and the ever-constant tides. People keep the stories in their pockets, they turn them over in their memory. Some of the edges may get smoothed out or change shape a little, but the stories get passed down over and over again. I’m from the Sonoran Desert, a place with expansive bright skies, extremes in temperature, shifts in light that give nod to the time when the area was all sea. When I hike to high points in the dry mountains on sunny days I look out across vast valleys and swear I can see the glitter and sheen of water, feel the fossils of long dead sea creatures lodged in the rocks beneath me. While Grand Manan is nearly the opposite of the Sonoran Desert in many ways, with its cooler temps, frequent fog, and emerald robe of green trees and vegetation, I couldn’t help but meditate on what the similarities could be between a desert and an island. Both environments are extreme in their own ways, the desert with its dry heat, and the sea with moody rip currents and storms. One’s eye is constantly trained to the horizon in the desert as it is to the sea. Without a deep ingrained knowledge and a discipline for preparedness, they can both be deadly rather quickly. There is a sense of isolation and contemplation in both environments, as well as people who tend to be resilient and independent. Does a landscape that requires these traits of its people, also foster a fierce sense of community? In Grand Manan I think it does. So many of Carole’s stories revolved around the communities built within family and neighbors, which quickly rippled out to the island as a whole. On our last night we went to a talk about Kent island at the Grand Manan Museum. I was standing near Russell Ingalls who, when someone asked teasingly if he had been present at the time the 1930’s film we were watching had been made showing logging activity in Seal Cove, simply replied to the question: “No I wasn’t, but I’ve been told.” This was such a strong statement to me, and speaks to the strong oral tradition of many islanders and their deep ties to Grand Manan, the sea, and to fishing. To their sense of community and their knowledge of how to read their natural surroundings. As I write this, Katie and Josh are making cookies in the sweet little Compass Rose B&B Flagg House kitchen that has been our home for the past two weeks. They are talking to each other through a series of communications about dough density, questions about egg cracking techniques, and chocolate chip ratio preferences. They are negotiating dough ball sizing, and joking with each other. Their hands are covered in sugar, flour and oats and they make frequent eye contact while mixing the sweet ingredients. They alternate between talking about the cookies and talking about the whales we saw yesterday. I sit typing away on my laptop listening to their cheerful chatter orbit the kitchen island, and I’m thinking about community, about the strong community that forms on islands in particular, and about the relationship the community members have not only with each other but with the natural world and the stories they tell. These stories get told while the cooking gets done, when the long light of afternoon is drifting through windows and people are sitting around and visiting with each other. So many of my experiences on Grand Manan have had to do with precisely this relationship between people and nature. From watching the full moon rise over Long Island, to research students banding tiny Savannah Sparrow chicks, to watching Russell Ingalls watch the water as he maneuvered his boat skillfully into the basin at Kent Island. 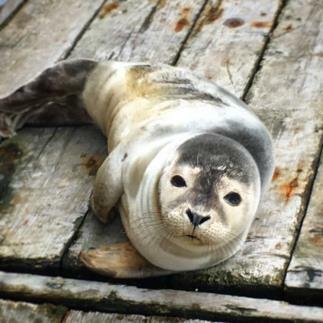 And for the pack of 10-12-year-old island boys kindly and curiously checking out the Harbor Seal pup resting on top of the lobster car at the North Head wharf, to seeing a field of hand-harvested dulse drying on huge round sunbaked rocks. How grateful I am to have spent time in this special place and talked to so many wonderful people about their experience of Grand Manan, the island they call home. Of the strokes I learned at canoe camp, the feather was my favorite: swiveling the blade of a paddle back and forth against the water, parallel to the gunnel, to approach a dock or another boat. I never thought I’d use it to pull my way closer to a salmon cage, as I was doing in my little red kayak. The Dark Harbour water was calm in its reflection of the purple-grey sky above and my black blade sent ripples in the direction of the fish. They were enclosed in netting suspended by a thick rubber floating rim, presumably netting that fell all the way to the ocean floor. One net on the interior of the cage kept the fish in, and another, on the outside, whose webbing was lined with strong metal wires, kept seals out, lest the dogs-of-the-sea reach in with whiskered snouts and dine their hearts out. Which happens, apparently. From the kayak, as I peered in, it seemed that the wire netting was working so far. No seal in sight. If you look at the cages from the wharf for long enough, you will see a glint of a salmon flank as it leaps from the water and towards the other side of the cage. I took the kayak out and down the slick intertidal because I wanted to be closer to the fish. Not too close, of course, no trespassing involved. But close enough to watch that leap. As I sat there in front of the oldest, largest salmon I couldn’t see the school, but I could almost feel them like a thrum in the hull of the kayak beneath me. Then, without warning, the jump! An eerie display of fish flesh hurtling through the air and falling. That’s why there’s netting on top of the cages too. 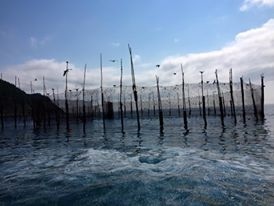 Carly Fleet, who has worked on aquaculture projects before, told us that sometimes a heron will perch on this netting and snake its neck through, beak agape, in anticipation of a jump. 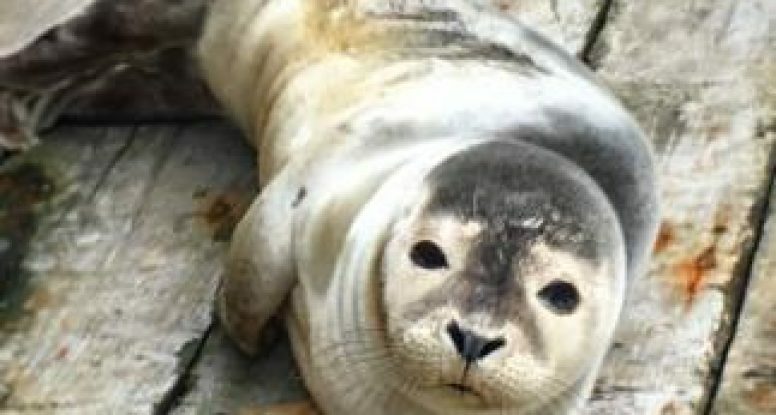 When I asked Matthew what challenges he faces in running this operation, he said the biggest task is keeping the fish alive, because if the seals don’t get them, then diseases might. While the Dark Harbour cages hold a relatively small population of salmon, larger operations further offshore contain tens of thousands of fish all living together in conditions that tend to promote the rapid spread of disease. Salmon are especially susceptible to parasitic sea lice, for example, which latch on to the fish and feed on their blood, skin and mucus. The lice spread when fish are in close contact with one another, which is of course inevitable in a cage. 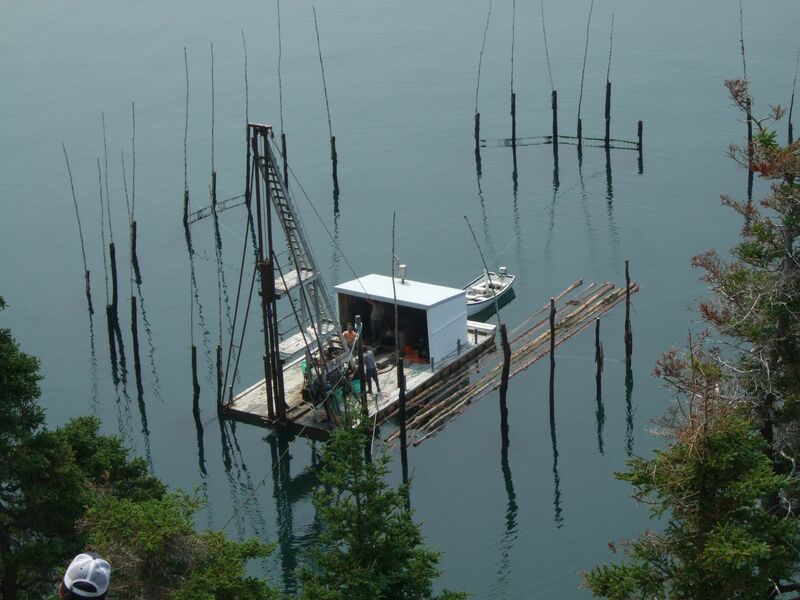 To keep salmon alive, some aquaculture companies will go to extreme measures. Back in 2009, Kelly Cove Salmon Ltd. applied the pesticide cypermethrin to offshore cages in an attempt to control sea lice. During our time in Grand Manan, we talked to several residents who are still concerned at what this chemical application has done to the marine ecosystem – and especially lobsters, for which cypermethrin is lethal. But floating around in Dark Harbour, paddling to the cage where the smolt were making their smaller leaps, I wasn’t thinking as much about the science of rearing salmon or its ecological implications. Instead I was considering the sheer challenge of taking on such a project in the first place. 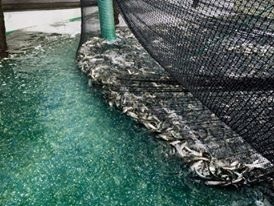 From these cages, humans were making an attempt to restock a major fish population in the rivers that feed the Bay of Fundy. Dropping fish from helicopters! The challenge of managing all of that, of not just heli-transport but simply keeping fish alive, seemed to reveal the severity of the broader decline of fisheries in the region. Such extreme human intervention reflected an increasingly precarious relationship between Grand Mananers and the fish that have supported the island for centuries. Dark Harbour, in all its evening magic, was a place that seemed to speak to that precariousness, and not just in the salmon cages. Earlier that day, perched on the thick round rocks of the Dark Harbour sea wall, our field studies crew had watched the early stages of weir building. A team of six men, moving quickly, winched a boat over a dip in the sea wall, and, on the other side, with a large floating driver, placed and hammered the weir stakes into formation. The machine was nearly as precise as the men who danced around it, their limbs and legs sprawling, grabbing, hoisting, splaying as the operation proceeded. To build a weir on Grand Manan is an investment of not only labor but substantial capital. 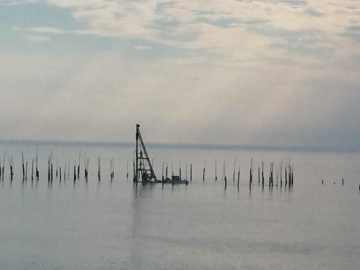 Each weir stake can cost up to five hundred dollars, and from the looks of it this crew was setting in at least ten stakes before nightfall. The way the men moved as a crew revealed their expert understanding of the unsteadiness of waves that rocked the craft. As we watched, men and raft swayed together, their silhouettes occasionally blurred by waves of fog that slipped by in sheets from the sea. Pulling up a stake, placing the stake, hammering it with the giant driver, hit by hit, as many clangs as it took to drive the sharpened tip of it into the ocean floor. Soon they would string the weir with twine, seine the weir, and haul herring from the sea. But there would only be a small chance that the profits would allow them to break even. That’s why, on an island where dozens of weirs once lined the shore, this year there are only twelve. 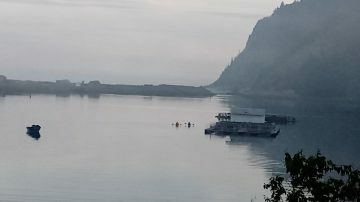 It struck me as we watched them that just beyond their silhouettes, in the distance, was the Grey Zone, another precarious area for Grand Mananers and fish, of the lobster variety (see Paco Cantu’s piece on the Grey Zone here). I’ve been told that the influx of lobster to the region, partially because of rising temperatures and climate change, has led to the “Grand Manan Gold Rush.” The good catches have brought millions of dollars of revenue to the island, so a potential to catch more during the summer months drives a number of boats out to the contested waters of the Grey Zone that lies along the U.S./ Canada border. But the lobster fishery, too, especially in the Grey Zone, is precarious. Will rising temperatures continue to push the creatures northwards beyond the Bay of Fundy? Will the intensiveness of the current fishing lead to a plummet in population numbers? 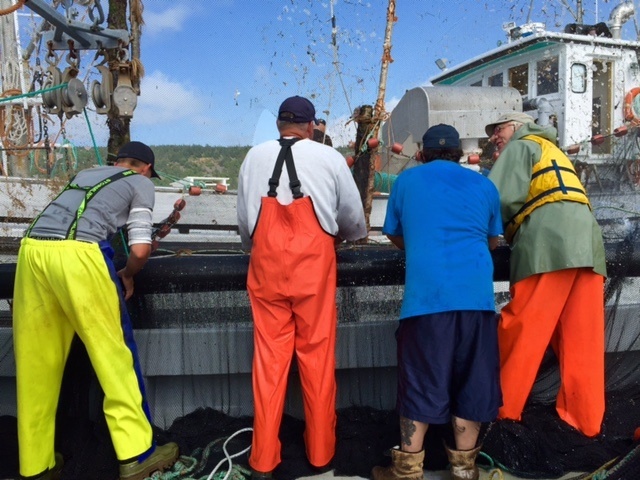 Many of the fishermen we have spoken with predict that they will remain in the Bay for several more years. But after that, what will be fished next? On one of the last days of our program, I visited the Grand Manan Museum and saw the exhibit that the first director of the museum created, which documents the history of fishing on the Island. It starts with black and white photos of herring seining, a diorama of a weir, and the curious words: The story of Grand Manan begins and ends with people and fish. I wonder what the director’s intentions were in using precisely those words. To claim an ending to any story as it’s still being written is either prescient or bold. But as I reviewed those words after learning from islanders over the past few weeks, I couldn’t help but feel that I had visited this place at a remarkable chapter in the story of people and fish; a story I glimpsed through netting and weir stakes that night in Dark Harbour. If the story of Grand Manan begins and ends with people and fish, what happens to the people as the fish continue to disappear? 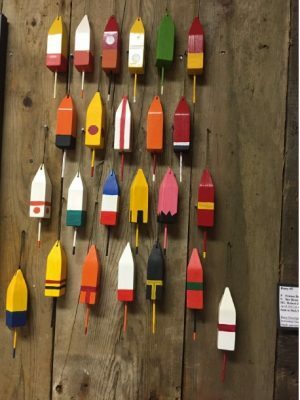 Model lobster buoys at the Grand Manan Museum; each color pattern corresponding to a distinct boat or family. 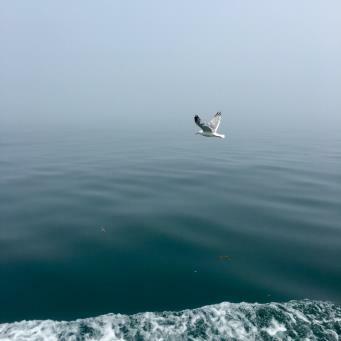 About five miles south of Grand Manan lies Kent Island, a home for nesting birds and spittlebugs and lots of fog. I’d hoped to visit the island during my stay on Grand Manan, but the trip wasn’t guaranteed. 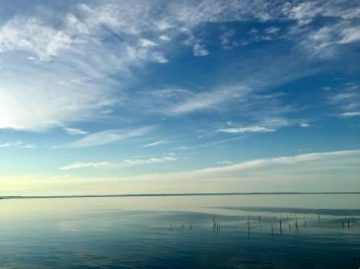 Boats bound for Kent Island are infrequent, and weather conditions needed to be favorable in order to make the journey out. On our daily schedule for Thursday, July 13, the proposed date of our trip, we simply drew a star, superstitiously thinking that writing out KENT ISLAND TRIP might jinx us. What if they run out of room on the boat? Or maybe storms might roll in. Our superstition rewarded us: we were greeted Thursday morning by calm waters and mild, drizzly weather. The trip was on. We hopped in the car, made a necessary stop at the North Head Bakery for cinnamon doughnuts and blueberry turnovers and more cinnamon doughnuts, and drove down to Seal Cove, where Russell Ingalls waited for us in his boat, Island Bound. We arrived at Kent Island at low tide, which meant Island Bound and its trusty skiff Chuck, could only take us so far: we’d have to walk through the muddy basin to reach shore. Thankfully, Ed Minot, the director of the Bowdoin Scientific Station on the island, and caretaker Mark Murray guided us across the tricky terrain, offering solid mud-walking advice like, Lift your heel up first so you don’t lose your boots! 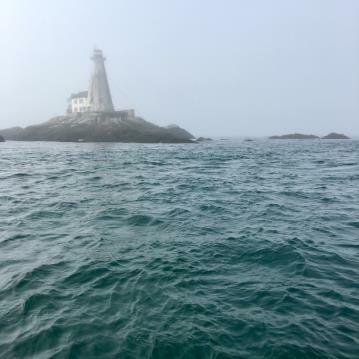 Fog attracted me to the Field Studies Grand Manan program, specifically the work of Bob Cunningham, who studied fog on Kent Island for seventy years, in what was the single longest continuous study by one person in one place, ever. 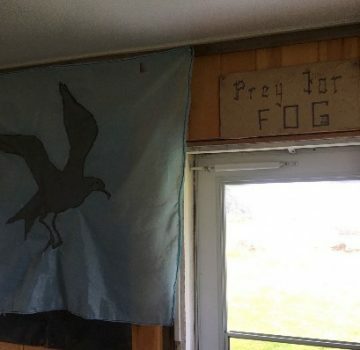 I had heard about Bob’s rudimentary methods for gathering fog and had seen photos of him hanging high from an aluminum pole, fixing an anemometer, but it wasn’t until I was out on Kent Island, standing in front of his small 8’ x 6’ shack, named Fog Heaven, that I could really imagine what those summers on the island must have been like for him. With only his shack and a few basic meteorological instruments, Bob performed research that would lead to the Clean Air Act of 1963. A headline from the June 30, 1940 issue of the Mount Washington Daily News describes Bob’s work succinctly: TECH MEN JAM FOG INTO JARS FOR RAIN RESEARCH. Today, the shack houses a Bowdoin College research student, and the weather station is much more sophisticated: Solar-powered instruments connected to WiFi collect data, and you can even watch a live webcam that shows the current conditions on Kent Island. Before lunch, we discovered a series of letters sent to Bob by Ernest Joy, Kent Island’s first caretaker who stayed on the island year-round with his wife, Carrie. His letters detail the critical role Ernest played in recording the weather conditions on Kent Island when Bob Cunningham was away. Ernest was also quite funny: he often joked with Bob about the weather, once claiming that the fog was so bad it nearly caused his eyebrows to mold! After lunch, Savannah-sparrow researcher and poet Ian Pristis led us on a walk through the meadow to see the birds’ nests. Savannah sparrows on Kent Island have their own unique song, Ian explained to us, and the sparrows pass on their songs from generation to generation. 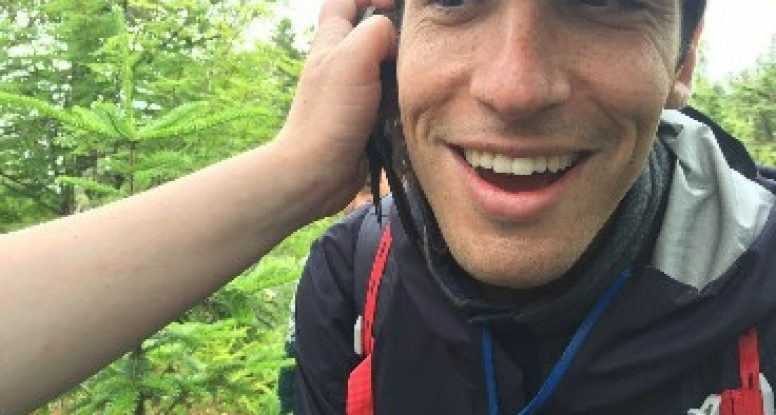 As part of his research, Ian and colleagues wanted to find out whether the sparrows can learn new songs. 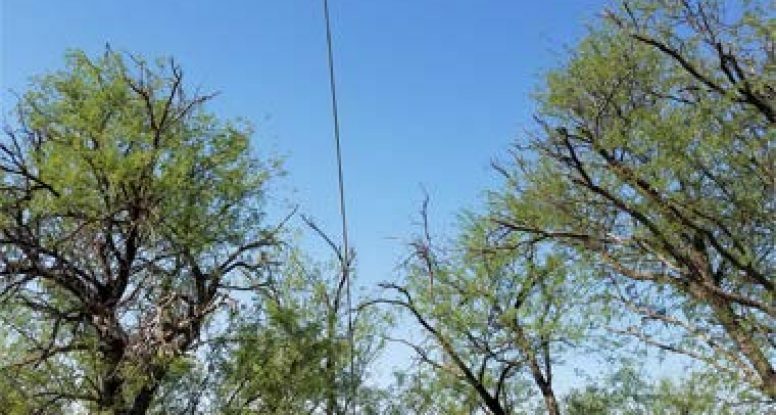 Camouflaged speakers line the trail and play these new songs, mimicking two birds communicating with each other. So far, some birds have indeed learned the new songs, and have even passed those songs on to the next generation. By 3pm, the tide had gone up, and our boat was waiting for us at the dock. 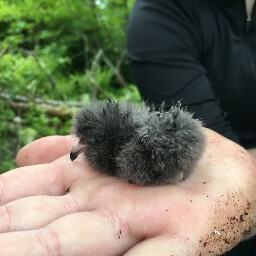 On our walk down to the water, a Bowdoin student offered to show us the storm petrels burrowing in the forest on Kent Island. Whisking us through the forest, she paused at a small clearing and leaned over, reaching her arm deep into a burrow, all the way past her elbow, in search of a petrel. “Feels like there’s a chick in here too,” she said. 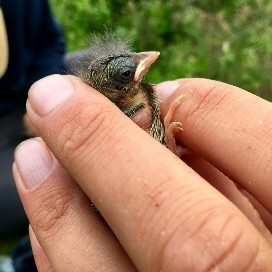 Carefully, she lifted out of its burrow a mature petrel. “Want to smell it?” she asked. I’d never been asked to smell a bird before. 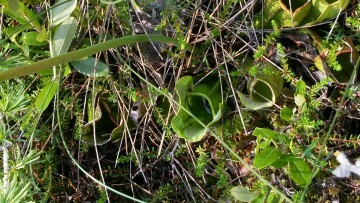 Its scent was rich and musty, like the forest floor itself. She then held the petrel up to our ears, the way you would a cell phone, and we heard its rapid heartbeat. Finally, she showed us the petrel chick, small and gray like a ball of dust, or a rain cloud. By the time we boarded the boat, the rain had picked up. A group of students from Dalhousie rode back with us, documenting the birds they saw in the water along the way. As I watched them record their findings, I thought about the similarities between scientists and writers, about how close observation is so central to both our work, and about how the boundary between these fields is so much more fluid than is usually assumed. I thought about Ian studying Savannah sparrows and imagined him taking measurements in his notebook, jotting down notes for a poem in the margins. 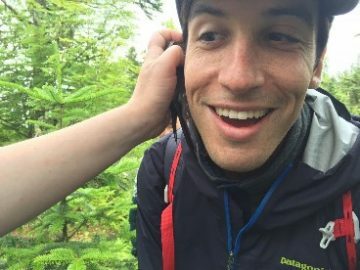 I thought about Zoe, a Bowdoin biology major who studies spittlebugs, who talked with us about the importance not only of performing research but of communicating that research clearly to a lay audience. I recalled the books scattered around the common area tables–field guides to local birds and plants and marine life, as well as novels like David Foster Wallace’s Infinite Jest and Colson Whitehead’s The Intuitionist–and thought about how Kent Island has all the makings of a place in which the sciences and the arts coexist. I hope I can return to Kent Island. I have this dream of everyone sitting around the long table where we ate lunch, after the research is done for the day, and discussing the essays and stories and poems inspired by work on the island, new songs to carry with us back to our respective homes when the summer ends. 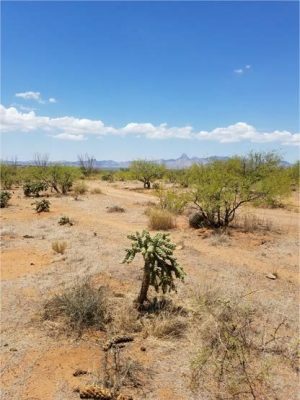 The University of Arizona Creative Writing Program is pleased to announce the pilot project for its Field Studies in Writing Southwest Program made possible with support from the Agnese Nelms Haury Program Environment and Social Justice and under the leadership of Alison Hawthorne Deming, Haury Chair and Regents’ Professor. 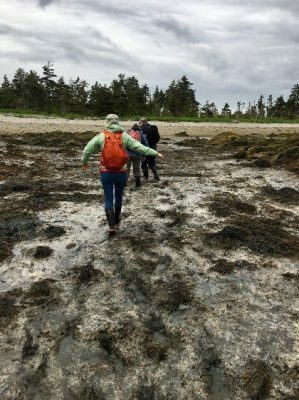 Like our Field Studies Grand Manan project, yhis initiative is intended explore how the literary arts can create humane responses to climate change, environmental, social justice and border issues. 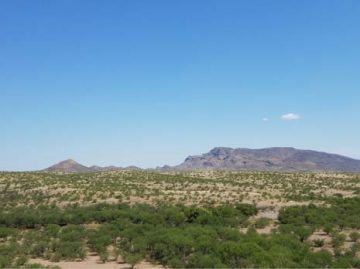 The new southwest project will be coordinated by recent MFA alum Paco Cantú; Associate Professor Susan Briante will serve as faculty facilitator. 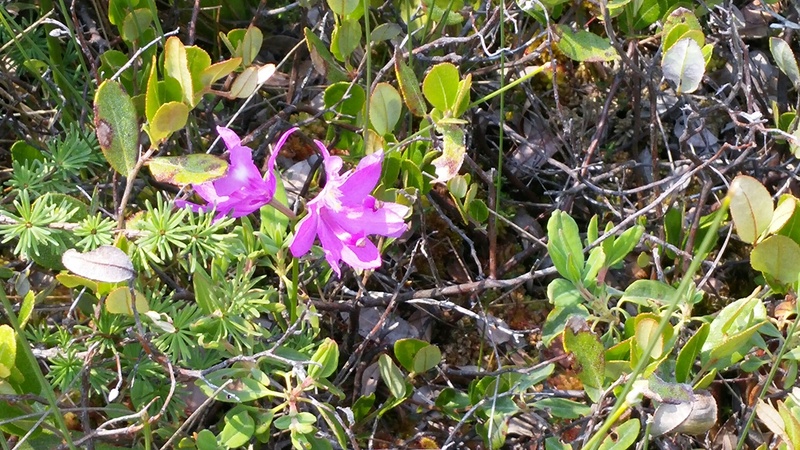 Ethnobotanist and Patagonia resident Gary Paul Nabhan also serves as consultant. 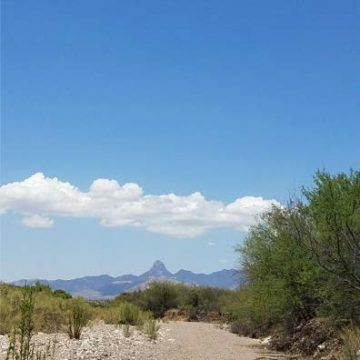 Participants will spend two weeks in southern Arizona, working in collaboration with the Borderlands Earth Care Youth Institute. This program, sponsored by the Borderlands Habitat Network, engages marginalized youth in hands-on restoration work of the local ecosystem while providing leadership and educational opportunities. 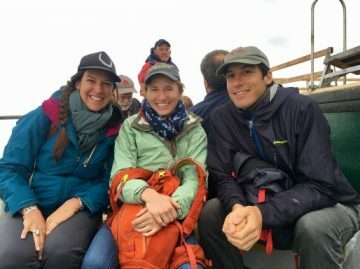 In March two MFA participants joined with graduate students from the Wake Forest University School of Theology, under the leadership of Fred Bahnson, author of Soil and Sacrament: A Spiritual Memoir of Food and Faith, to visit the Native Seeds/ Search farm in Patagonia and the Kino Border Initiative in preparation for the summer program. Abby Dockter is an MFA candidate in Creative Nonfiction from Farmington, New Mexico. She spent a few years following field and lab science jobs up and down the Rockies, and has written as a science communicator for UA’s Institute of the Environment. Her most irresistible interests are (pre)history and ethnobotany, how we change our surroundings and how they in turn change us. She enjoys long, dry archaeological reports, and usually hikes with poetry. Gabriel Dozal is an MFA Candidate in Poetry at the University of Arizona from El Paso TX. He is concerned with defining the extreme code-switching, camouflage, and chameleon nature of the culture of the borderlands. Raquel Gutiérrez is a bilingual poet and essayist pursuing an MFA degree in poetry at the University of Arizona. Born and raised in Los Angeles, she writes about language, history, space and institutionality and publishes chapbooks by queers of color with the tiny press Econo Textual Objects, established in 2014. Her work has found homes in Huizache, The Portland Review, Los Angeles Weekly, GLQ: Gay and Lesbian Quarterly and Entropy. I have been living in Tucson for a year now. Friends, acquaintances, and strangers from near and far tell me they love the images they see on my various social media feeds of this mysterious moonscape-like desert surrounding Tucson. Many of “my followers” live along both coasts so of course it is gives me great pleasure to be able to ignite an awe for the uncontainable beauty of the Sonoran Desert even if it is from afar. For me being in this desert on any given morning or early evening means being given over to the expanse of possibility the landscape offers. It has been the way to get new perspectives when stuck on a writing project—to step out into any number of trails and parks that surround Tucson and take it all in. Whether it’s the way the light moves across the shallow valleys of Gates Pass before sunset or the way the temperature surprisingly drops ten degrees when your trail takes you into the shadowy parts that sit below Pima Canyon, the infinity of surprise that lives here is hard to deny. But as the temperatures increase, as they have this summer with every indication of the 110-117 degrees pointing to a climate change that may not be reversible in years to come, there is another thing one cannot deny—any slight carelessness on your part and the desert will kill you. And that fact made itself clear on a recent ride-along outing with Guillermo and Stephen, two volunteer truck drivers for the Southern Arizona organization Humane Borders/Fronteras Compasivas. As soon as we—Abby Dockter, Gabriel Dozal and myself, a trio of Creative Writing grad students from the University of Arizona currently engaging in a Southwestern Field Studies program sponsored by UA’s Agnese Nelms Haury Program—climbed into the water replenishment truck we were told that if we broke down in Arivaca, an hour and fifteen minutes south of Tucson, we would be exposed to the same conditions as the Latinx migrants we were trying to help. I looked at both my comrades and shook off any doubt that we would not be okay. We were the lucky ones after all traveling with over 100 gallons of water into the harshest topographies in the Southwest. At the worst, we would be sweaty and uncomfortable, changing the imaginary flat tire in my mind’s wandering to worry—but we wouldn’t die. That’s how I made contact and peace with the privilege I carried into different parts of the valley that blanketed the infamous border town of Arivaca. If there was anything to do with the privilege it was to risk it. 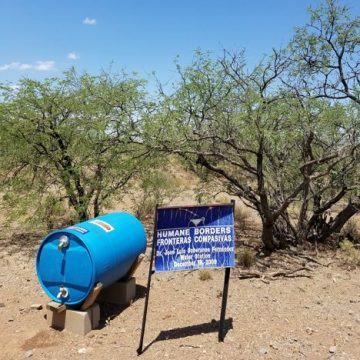 According to their website, Humane Borders maintains a system of water stations in the Sonoran Desert on routes used by migrants making the perilous journey to the North mostly by foot. Getting into the truck at Green Valley, we were promptly driven to the first water station situated behind a pecan orchard. The orchard looked strangely out of place and time with its trees lined up tightly towering above a few acres covered by bright green grass, an indication of the obscene amounts of water it must have consumed on a daily basis for it to look that way. But I was thankful nonetheless for its existence and hoped it was there to offer some shady respite to the men, women, and children who made the orchard a part of their journey. As soon as we got to the water station my heart swelled with a convergence of emotions. I may have quietly gasped at sight of concrete blocks, a quartet of 2×4 wood planks, and a 55-gallon plastic blue barrel sitting stoutly but bravely above the dried out arroyo behind it where I imagined weary travelers would emerge. In the distance, I continued imagining that I could hear a chorus of sighs of relief at the sight of a purple flag whose color had been made dull by the daily solar pounding it takes while waving intrepidly in the hot summer wind. 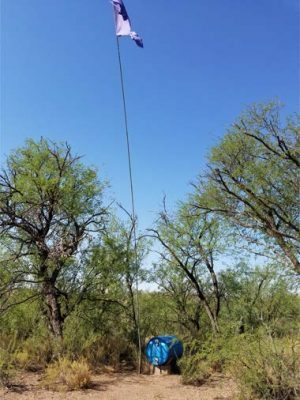 After surveying the water station for cleanliness, potability, visibility, and instances of possible tampering, we moved on to the next water station destination in Arivaca proper, Elephant Head. 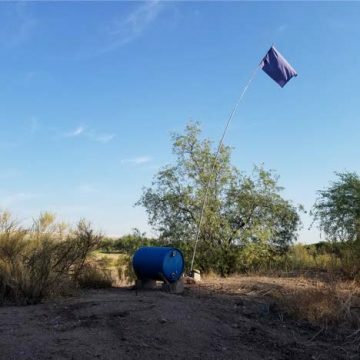 But before heading out of the pecan orchard Stephen asked Guillermo, who was driving, to stop by a peripheral section of the orchard where he spotted empty water bottles and a spectrum of detritus of migrants past. Plastic bottles that were empty but still intact signaled recent passage. 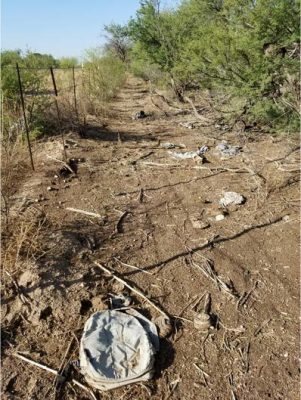 However, there were old, discarded backpacks that like the life they carried inside them looked as desiccated as any living creature that succumbs to the harsh conditions of a merciless desert. It was those bits of human evidence that made the area seem anachronistic—to travel by foot in a time saturated by every imaginable technology is maddening, if you think about it for too long. Over the course of the next nine hours I would be mad and quite maddened. It is this affective drive that impels volunteers like Guillermo and Stephen to make this trip every 2-3 weeks for the last two years. When we arrived at Elephant Head I noticed something that wasn’t on the first blue container. 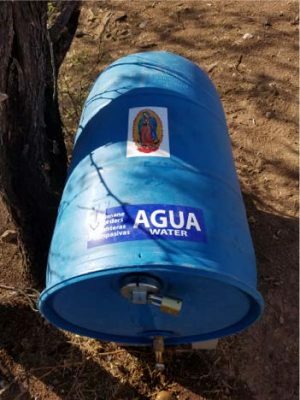 La Virgen de Guadalupe. I should clarify that it was just a glossy sticker with her likeness. All of my twelve-years’-worth of nostalgic Catholic School hackles went up at the sight of the feminine deity that made her debut on a hill in Tepeyac, Mexico. An apparition that only an indigenous man re-christened Juan Diego could witness. Stephen noticed me noticing her and said it’s hopefully a way migrants can understand that the water station is there to help. I nodded approvingly, but behind my sunglasses and smile I bit my lip and pinched the muffin top peeking over my belt loop to keep from crying. did our best looking out for others. Gabe asked what would we do if we encountered a migrant to which Stephen quickly replied we’d give them food, first aid, and water. As the morning progressed and the sun’s rays intensified, I felt the sweat pooling in and around my body’s various concaves and then disappear. The desert was taking its rightful tithe of moisture from me. We snacked on sweet baby peppers and threw the ends out the window to which Guillermo would say it would be a few hours tops before the desert consumed our biodegradable trash. We could all be untraceable. It would be so easy here traversing Arivaca’s desert veins and arteries. I started thinking about the ways in which the untraceable is made evident. Or how the migrant’s journey has been represented to me throughout my life as both reader and writer as well as the 1980s child of Latinx immigrants from El Salvador and Mexico and the one in the here and now—the adult child. In prose we have writers like Rubén Martínez and Reyna Grande rendering the experience of crossing over, their portraits of others or selves desperate to reunite with family in the North, all of whom in various pursuits of better economic stability. As a reader, these literary voices have meant to me finding the language to illustrate the ways these migratory traumas continue to haunt families both constituted by and torn apart by inhumane border policies. But my parents’ migration took place in the late 1960s and early 1970s—they were essentially crossing an imaginary wall with nary an agent policing those boundaries. Dare I say they came to the North in the innocent hey-day of border crossing on par with episodes of The Brady Bunch? Or the golden age of border law breaking when detention centers meant nothing more than a bus ride to Ciudad Júarez or Tijuana while Los Tigres del Norte sang earnestly about contraband and betrayal in a drug deal between lovers gone wrong. But here in the desert the migrant’s journey is represented to itself and to strangers like me who witness that representation, making the experience of being here that much more urgent. Take the work of Alvaro Enciso’s monuments to fallen migrants for example. 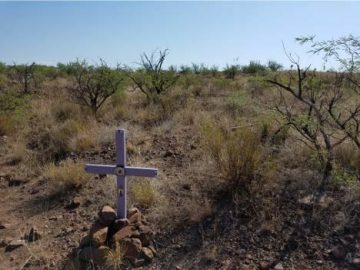 These are colorful crosses affixed to coordinates that mark where a migrant lost their life during the journey through Arivaca and other parts of Southern Arizona. Seeing these crucifixes made unique in color and metal details in complimentary colors in their intended habitat allows the spectator—whether another migrant, a border agent, or someone engaged in humanitarian aid—a profound empathic encounter that enables a communing with the recently deceased while bringing to the mind’s fore the realistic circumstance of future migrants dying in the desert nearby. It is these kinds of artistic representations that operate as both homage and reminder that we need each other to get by. We need each other to remember. We need each other to witness. “¡La Migra!” and everyone ran. and you flew from my side in the dirt. ready to press its index. and I’ve never thanked you. and I went west to San Francisco. that shield me now, from La Migra. The day we spent lobster fishing in the “Grey Zone” south of Grand Manan was, without question, the longest day of our trip, and it also the required the earliest start. We set our alarms at 4AM and while Page and Jan ate a quick breakfast of PB&J, I cooked up a box of Kraft macaroni and cheese (known as “Kraft Dinner” in Canada) in order to “carbo load” for the Grand Manan Half Marathon, which I would foolhardily run later that day. We arrived at the Seal Cove wharf at 4:45, before the first light had begun to glow on the Eastern horizon. 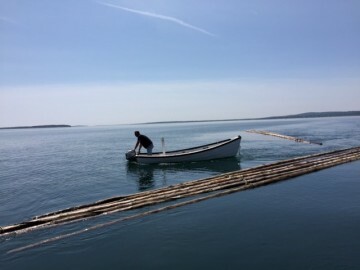 Several days ago Jan had interviewed one of Grand Manan’s most respected fisherman, Laurence Cook, and through charm and good fortune managed to arrange for the three of us to tag along with him for a day of lobster fishing. “Be prepared for a long day,” he advised. 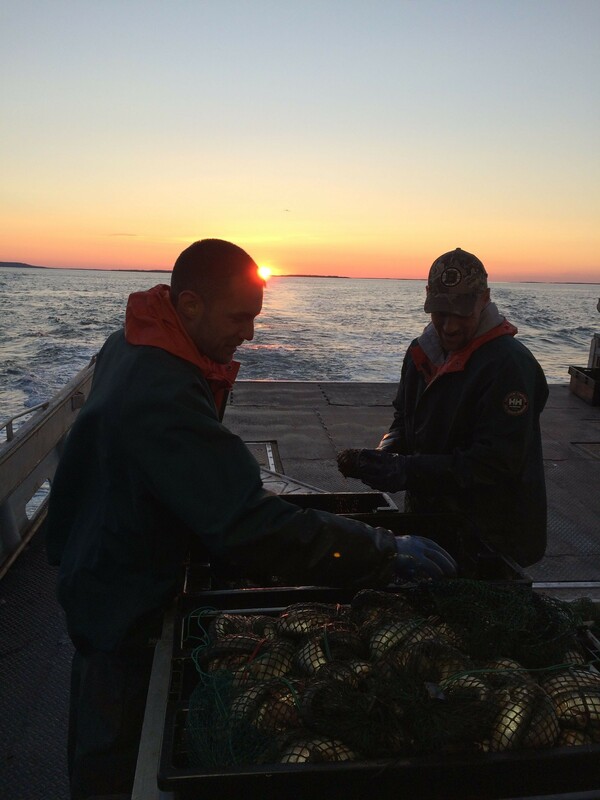 When Laurence showed up, at 5 o’clock on the dot, his two crew members jumped into action, unmooring the boat and packing bait pouches with rotting herring. “The smellier it is, the more they like it,” one of the men told us, grinning. 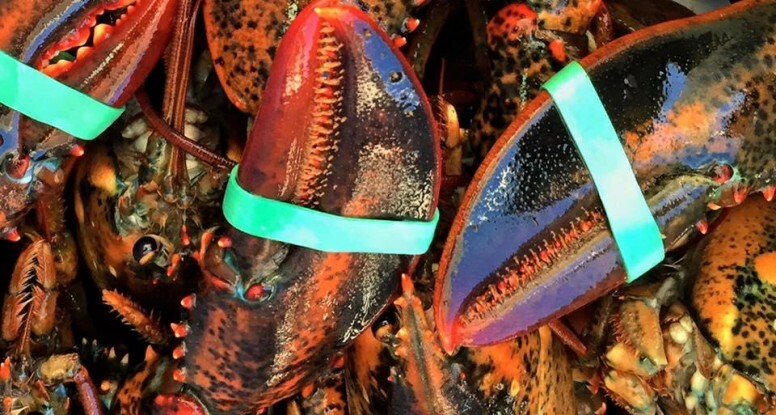 But even lobsters have standards, we soon found out. One of the herring boxes, left in the sun a few days too many, was writhing with maggots, and to our relief was summarily dumped overboard. As we sailed out of Seal Cove toward the open sea, we were treated to a remarkable sunrise–our only one of the trip, due to many late nights fueled by long conversations with our island hosts. 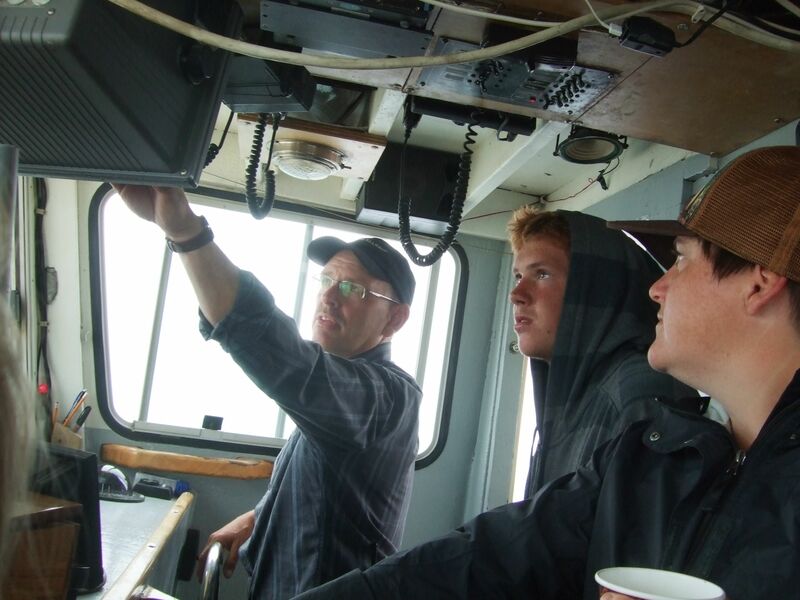 Laurence explained the particulars of fishing in the “Grey Zone” to us as we sailed south in the early morning light. 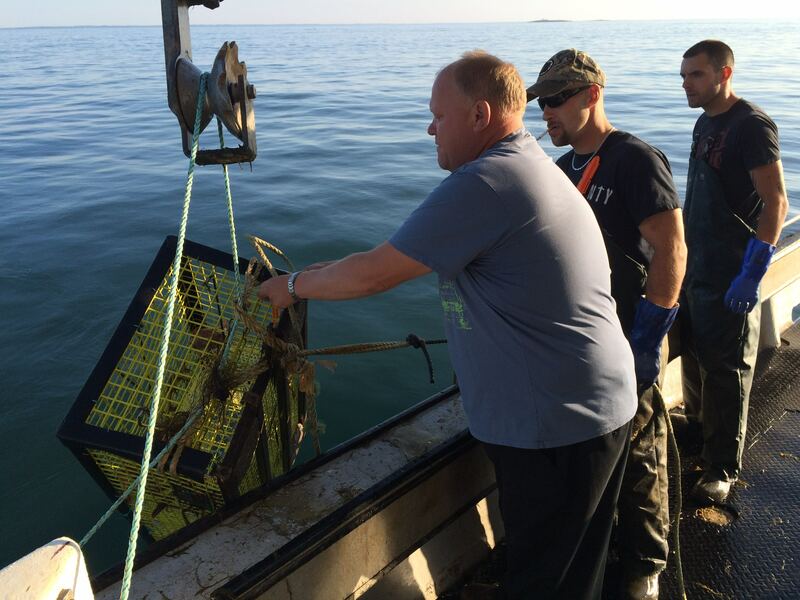 In Canada, the lobster season runs from November until the end of June, with a strict moratorium on laying traps during the off months. 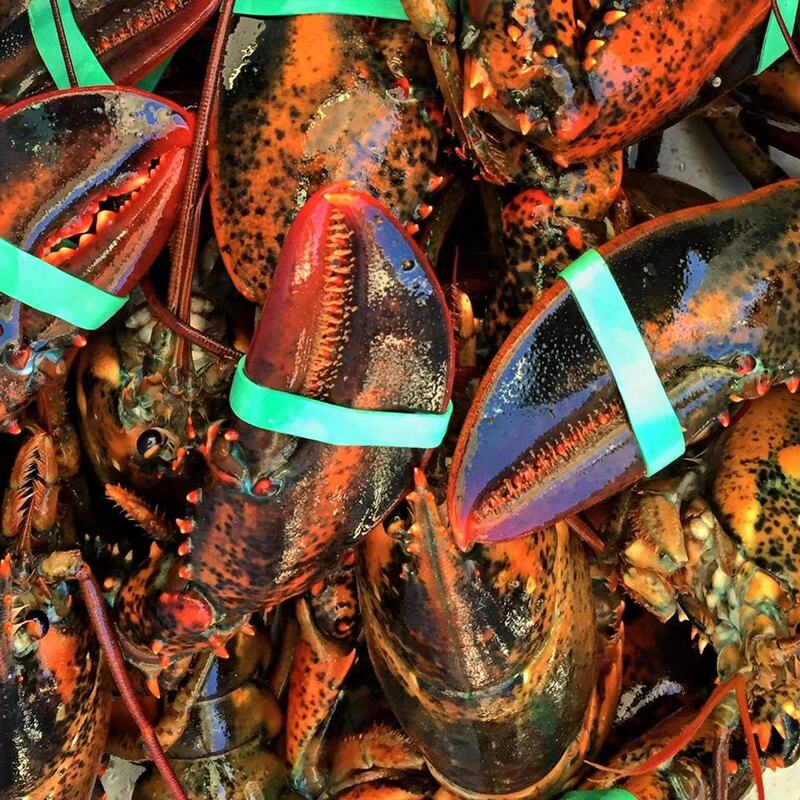 In the US, however, fisherman are allowed to catch lobster year-round. Because of a still-unresolved jurisdictional dispute over international fishing rights between Canada and the US, a “Grey Zone” has existed along the border between New Brunswick and Maine, where vessels from both countries are allowed to fish the same waters. Canadian boats are allowed to fish lobster within the Grey Zone outside the regular season, as long as they submit to the installation of black box devices that ping their location every 15 minutes via satellite to Canada’s Department of Fisheries and Oceans, ensuring that they don’t venture into sovereign American waters. Laurence, despite having taken advantage of the extra months of lobstering since the opening of the Grey Zone to Canadian fishermen 2002, told us that he’d prefer an “equitable, rational plan” to the hazy status quo of the present. Fishing in crowded and disputed waters ratchets up tensions between competing Canadian and American fisherman–and sometimes even among countrymen. 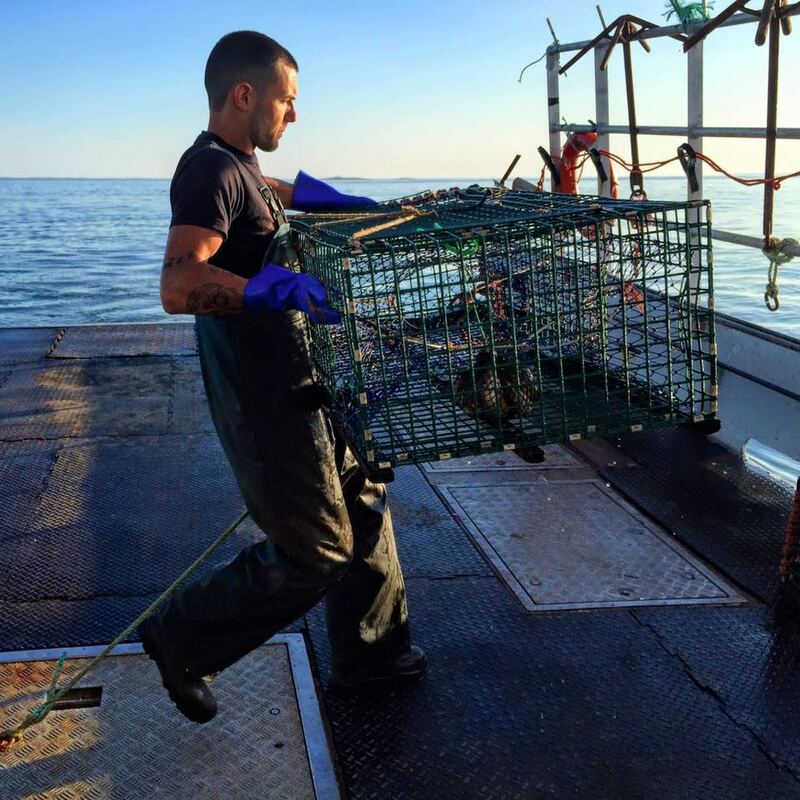 Traps are frequently cut, leaving a multitude of ropes, anchors and countless lobster traps unrecoverable on the bottom of the sea floor at great cost to fisherman. Guns have been pulled. Pursuits through fog and bad weather have ensued. Canadian vessels have been boarded by the U.S. Coast Guard, at risk of causing an “international incident.” “The younger guys come out here and get excited,” Laurence explains, but it is clear that he prefers to operate with a bit more calm and reserve. “I don’t wanna start a war,” he tells us. It’s safe to say that Jan, Page, and I spent the better part of the ensuing hours marveling at the strength, efficiency, and hard-working focus of Laurence’s crew as they engaged in the bewildering multi-tasking necessary to safely complete this process time after time. Adrift as we were on flat, sunny waters, we were further baffled by the fact that these men were required to do the same back-breaking work at this pace through all manner of inclement weather–in the freezing cold and during roiling storms. We had all heard that commercial fishing was the most dangerous occupation in the world, and now we understood why: whizzing pullies, the constant looping and unfurling of rope, the fast sinking of anchors and traps–all of it threatening to meet even the most temporary lapse in attention with a quick snap, whip, pull, or drag into the frigid waters of the Bay of Fundy. After nearly 14 hours aboard the boat, we were in awe of Laurence’s sharp presence of mind and the hardworking perseverance of his crew. Laurence and his men were frustrated with the day’s haul–they suspected that several of their trawls had already been hauled up and picked through by rival fishing vessels during the week. Indeed, there was a palpable air of lawlessness in the Grey Zone, the same lingering threat of disorder and unpredictability that so often pervades along unguarded frontiers. It was obvious that Laurence does his best to stay above it, to temper himself during tense situations as much as possible. Many of Laurence’s trawls had been laid on top of that day, and we watched him painstakingly cut and and knot his ropes to re-make his trawl lines. “I don’t cut other people’s traps and they don’t cut mine,” he told us. After all, he’s not trying to start a war. 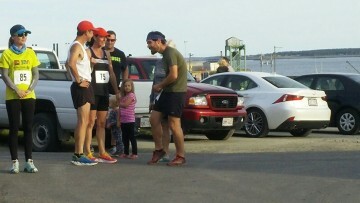 Paco did run in the half marathon, a benefit for the Grand Manan Boys and Girls Club, at the end of a nearly fourteen-hour lobstering day. He won third place. Talk about stamina. Though there were only three men in the race. Still a mighty day. We’ve been fortunate to work with six Grand Manan high school students during our stay on the island: Lawron Ingersoll, Liam Watkins, Michael Brown, Mackenzie Russell, Madison McLaughlin, and Harley Cary. They’ve all been instrumental in providing a lens for our visit by bringing us on backwoods trails, introducing us to their grandmothers, teaching us how to jig for squid, dig clams, and have kept us laughing the whole time. 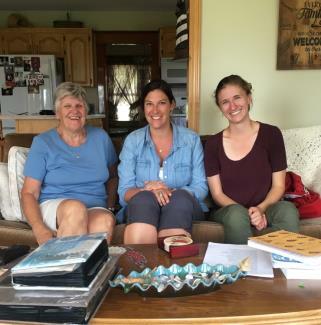 They are each working on a creative project to document Grand Manan stories and histories. I want to dedicate this post to all six of our students and take this opportunity to share several extraordinary moments we shared with them. 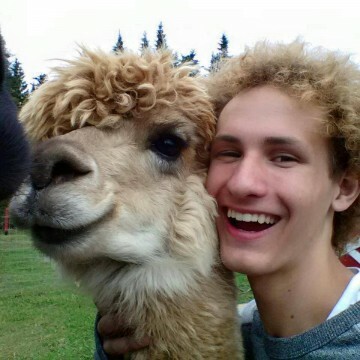 And here’s a photo of Mackenzie with an alpaca just for fun. Our first weekend on the island, Mackenzie and Liam took Page, Paco and me squid jigging. If you’ve never jigged for squid, it’s best done at night when the squid come out to feed, with a rod and brightly colored plastic lure, two rows of curved metal hooks at the bottom. Jig is the term for the lure and also the jerking motion used to attract the squid. We walked to the North Head Wharf at 10 p.m. at half-tide. Part of the intricate weave of the wooden wharf covered in algae and kelp was visible below us as the dark of night finally set in about an hour after sunset. 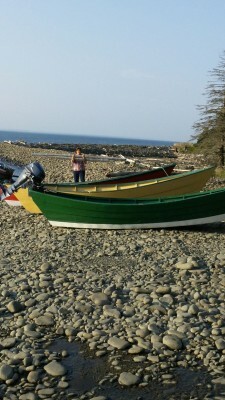 We walked past the lobster boats, some long, wide and shiny; others weathered with “for sale” signs. Liam had been out there with his fishing pole and guitar (he’s a talented self-taught musician) since 5 p.m. and hadn’t caught a thing. Mackenzie hung out on the wharf snap-chatting and laughing. A family from Newfoundland a.k.a “Newfies” had a multi-generational squid jigging operation with buckets full of their catch at the top of the wharf. A swarm of smaller children from “Whale Camp” (a summer program attended mostly by young American kids) got a squid jigging lesson from a camp counselor. 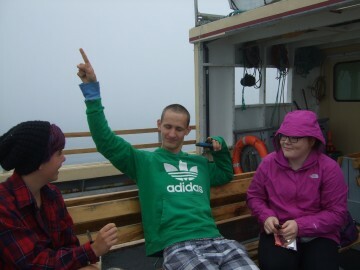 Several other Grand Manan high school students jigged next to Liam. I looked down to see the swirling rise and fall of a school of brown squid. They swarmed just below the surface in a group of several hundred, moving up, down, back and forth as if tied together on an invisible dancing net. Soon after we arrived, a seal rushed close to the wharf, scattering the squid. The floodlight above gave everyone’s faces a yellow hue and cast light at the perfect angle to illuminate the strange tentacled creatures underwater. 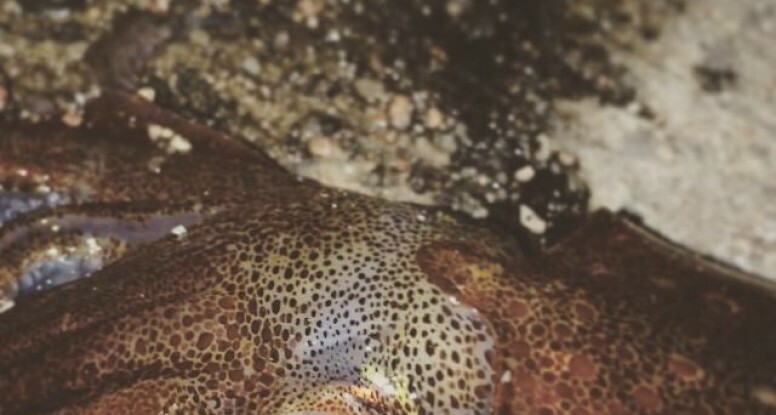 A high school student named Vaughn quickly caught eight squid in about ten minutes. I asked Vaughn to give us some tips: cast out far and low; drag the jig in giving it slight jerks (or “jigs”) so the squid think your lure is a shiny fish. To my and Page’s dismay, Paco quickly caught two squid. As he brought one up to our bucket, he inadvertently squirted dark ink all over himself and his hipster jacket. Paco repeated, “I got inked. I got inked!” excitedly in his falsetto I’m-totally-surprised voice. Liam handled the squid as we all stared at its large googly eyes, its translucent speckled brown body, and squirmy tentacles at its end. Liam explained that we had to remove the ink in the process of cleaning it. As he showed us, he squirted stinky ink all over his hands and shirt, more on Paco’s jacket. The Whale Camp kids squealed. Mackenzie said he likes to catch the squid with his bare hands when they are particularly thick around the wharf, refusing a rod or jig. He clambered to lie belly-down on a lobster car (a wooden raft for storing live lobsters in underwater compartments before transfer to market or tank house storage facilities). With his arms in the water up to his elbows, Mackenzie tried to grab the squid by the body when a group swarmed by. He didn’t catch a single one. 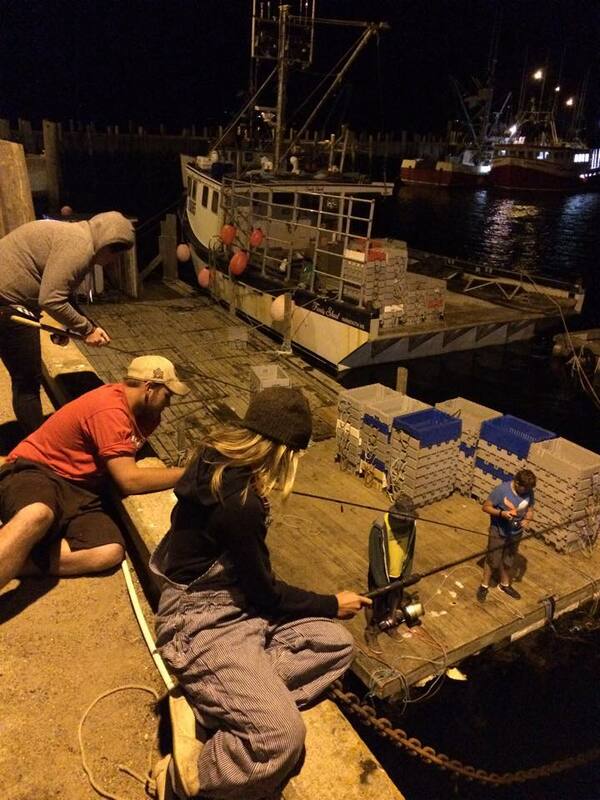 Before we knew it, it was nearly 1 a.m.; the elusive squid teased us, evading our lures right in front of our eyes. Only having caught two, we gave our bounty to the Newfie family. The father showed us how to clean the squid with several quick swipes of a small sharp knife. Here’s a short video clip of Michael digging for clams, a bit shy in front of the video camera. 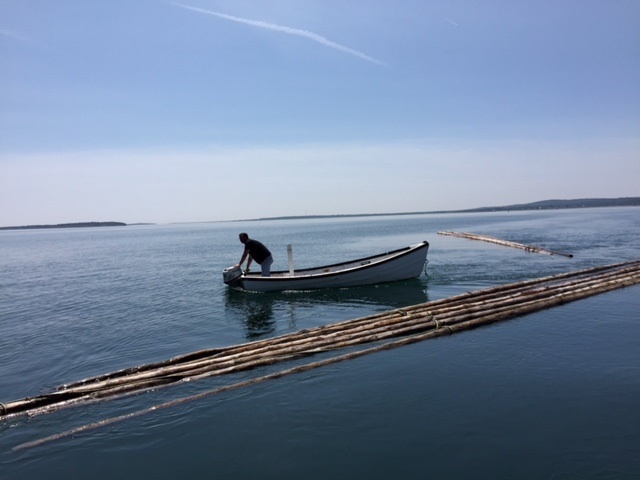 Michael lives with the ebb and flow of the tide by digging clams, picking dulse (edible seaweed), and working on his grandfather’s lobster boat. He buzzes around in a skiff he calls “The Little Tipsy.” Michael speaks in abrupt truths that often strike me with their vulnerability and sharp social and emotional analysis. Michael dug about $100 worth of clams that day. I helped a little. As we dug, Gordy and Michael gossiped back and forth, talked about Michael’s family, the recent passing of his grandmother and guardian Rilla Greene who was described in her obituary as “never afraid of hard days work.” Someone I wish I could have met, Rilla worked in the fishing industry boning herring, in the sardine factory, and most recently as a dockside monitor for local fishing companies. Michael explained that she drove herself to the hospital in the final days of her life. I had the sense that Gordy keeps an eye on Michael. Although Michael feigned a competitive tone when Gordy first arrived, it became clear the longer we dug, how much the two respected each other. 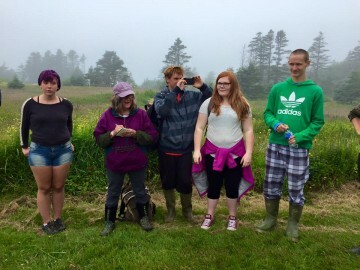 I feel enormous gratitude for the generosity of these students and all the other Grand Mananers who invited us into their homes, onto their boats, who fed us delicious seafood chowder, and let us take notes while they lobster fished. I will remember these two weeks on the island for the rest of my life. Leading up to our Grand Manan visit we read of weirs and tried to understand their complicated structure and function, their ingenious design. They’re difficult to comprehend, so when we got the opportunity to witness a weir being seined, we were thrilled. The day before we went to fish the weir I visited one being repaired from damage done last winter. A pile driver was used to replace stakes – the towering hardwood poles that make up the skeleton of the weir shape and structure. The stakes were tied together in a floating raft and dragged out to the site by a skiff. 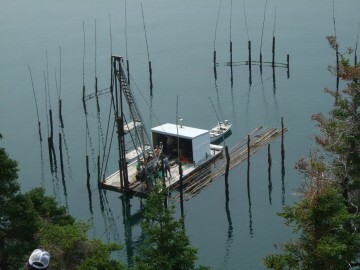 The pile driver, installed on a dock-like platform, was hauled out by a larger boat. Once inside the weir, the men boarded the driver and set to work pounding the stakes into the ocean floor. Over the murmur I heard the men discussing, in brief sentences and nods and a language I’m not privy to, the prospects of herring this season. The overall outlook is grim, but there was mention of one weir soon to be seined. I asked who was planning on seining? Could we see it from the sea wall at Dark Harbour? Before the day was up, the man I asked told me to be at Dark Harbor by 1:45 p.m., and that Captain Stacy Brown would take us on his boat so we could see them seine the herring from inside the weir. These opportunities are made possible often and only by the generosity of people we have met here. Stacy, his wife Annise and his son Dawson, along with the rest of the crew, invited us aboard. 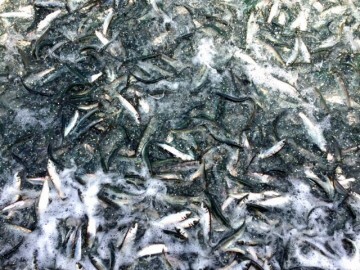 They’d been out early that morning “feeling” for herring. In a skiff they motored out, dropped a lead weight attached to a copper wire until it hovered just above the floor and drove circles around the weir. 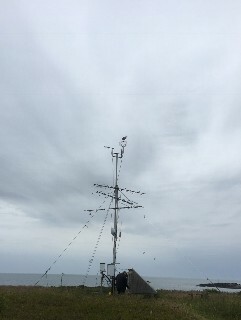 Based on the number of taps on the wire and the force of them, Stacy guessed how many fish were below, using his estimates to predict the size of carrier ship needed to haul the harvest to processing plants off the island. Stacy guessed the weir contained 22-hogshead (1 hogshead = 1250 lbs) of herring roughly 7” long. Observing the seining of the weir brought into focus a process I before understood hazily at best. It’s a process I am still struggling to explain, though I have no doubt that if I manage to describe it adequately in future writing, I can do so only because I had the opportunity to witness it: to witness the setting of the net, the way it circles around the herring already captured in the weir; the way the process responds and waits and rushes depending on the tide; the role of the diver who swims beneath, ensuring the fish are secured within the net, the purse. 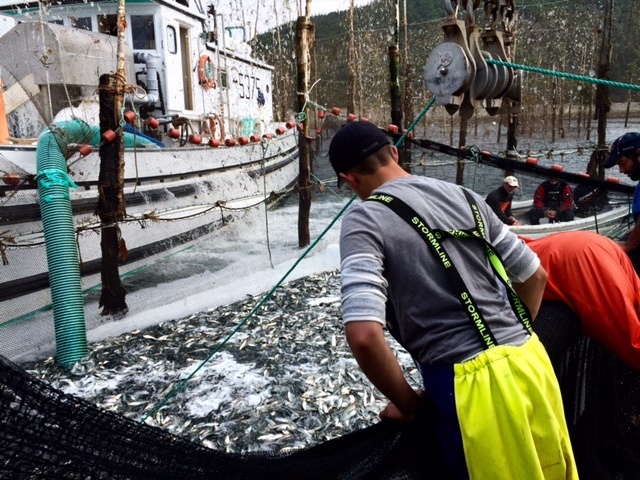 And then to watch as the net is hauled up until the herring spiral just beneath the surface. And then up another couple of inches until they are flopping about, vacuumed up by a giant tube dangling off the carrier on the outside of the weir, deposited into a giant storage tank on board. Their scales drift away in the process, leaving first just glitter in the water surrounding the seine, then frothing into thick white foam. The men above the carrier measure the fish: 22 hogshead of herring approximately 6.5 inches long. The crew is pleased; the catch puts them on the book. Though it is nothing like the heyday of years past, it is better than last year when they seined only four times throughout the entire season and didn’t even recover the money spent on repairs from the winter before. Stacy’s wife, Annise, was instrumental in engaging Paco and me in the process. Without her explanations we would have been lost—excited and engaged, but confused. The crew answered our incessant questions graciously, made sure we understood what was happening, and offered us front row seats. A quick post here to add a link to a gorgeous album of photos taken by Peter Cunningham on our Kent Island trip. Please enjoy and share! There is nothing to do on Grand Manan. No mall, movie theater, no pub. Still we have been busier than bees in a clover field for the past few days exploring the place and getting to know people. Squid jigging at midnight at the fisherman’s wharf, hiking to Hay Point with the Monday Morning Hikers, sitting around a beach fire watching fireworks pop from several spots along the shore including our own, riding out with the pile driver to observe repairs on the Intruder weir and to Dark Harbour to watch the seining of that weir have all been part of the orientation for our visitors to island life. We are so grateful for the great generosity of islanders who’ve been sharing their stories and educating us about the state of the fishery and concerns about its future. Page and I took a walk at the Anchorage Park and into the Bog Trail where we found orchids and pitcher plants blooming, and tassels of wild cotton topping their stalks. We were up to our ankles in wet peat, but that was no price to pay for the strange beauty of the plants adapted to this habitat. The Grand Manan students have been great ambassadors for the island, as they work on projects about the places that mean something to them and the stories that come out of those places: Dark Harbour, Cheney’s Passage, Stanley’s Beach, Eel Lake, Seal Cove, out on the water and more. Today we all made a field trip to the Bowdoin College Scientific Station on Kent Island, thanks to Russell Ingalls who ran us over from Seal Cove through thick fog. Peter Cunningham took us to Fog Heaven where we learned about the work his father Robert Cunningham did here for 60 years or so studying fog. “A pure scientist,” Peter calls him, just as Peter is “a pure photographer,” both of them moved by a genuine curiosity to know. The weather station is gearing up to begin again sending out data, so this site will continue to make a contribution to understandings about climate change, building on decades of data already gathered. Stay tuned for guest posts here from Jan, Page and Paco, along with some of their photographs from their travels. Harley Cary and Page Buono have also posted very poetic photos on their Facebook pages. Check them out!